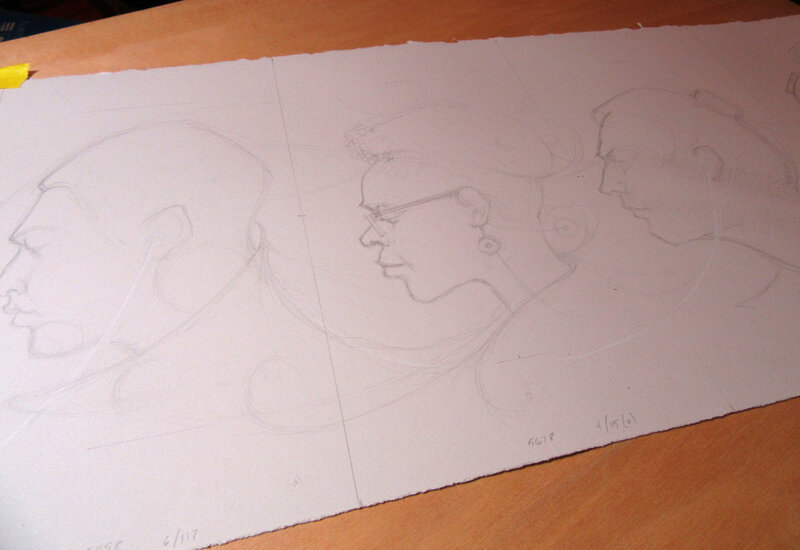 I haven’t done any architectural drawing this past year, but I still draw people on the el every day. My 8th sketchbook for this project is half way full… at this point I turn the book upside down and draw on the empty pages going back to the beginning. 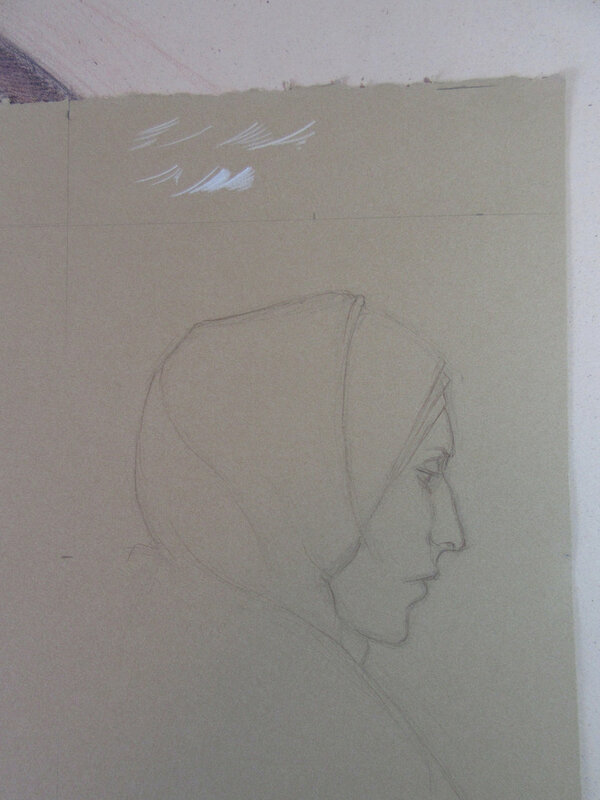 Since I have a decided preference for drawing profiles of people facing to my left, this works out great : ) My facebook art page has an album where I have some images of these sketches. Airtable, as I mentioned in a previous post, is wonderful for keeping track of the drawings and all their related information (which page are they on in the particular sketchbook, which way are they facing, are they ‘wired' in (listening to something with earbuds or headphones) etc.) From doing the studies that I showed in the previous post, the actual drawing on the good paper will be from the sketchbook drawing directly, in addition to the large photo-shopped version on the computer screen, so it’s helpful to know how to find the original sketch. I’m ordering the Stonehenge paper roll from Talas, as they seem to be the cheapest. The weird thing is…. my friend Cecile mentioned something the other day about how she liked the darker paper because the white of the earbud wires would show up better….. and she’s right. It occurred to me as I was writing this today that the darker paper, the Stonehenge Kraft, was closer in tone to an old favorite paper of mine. Many moons ago, I took a few classes at the Pennsylvania Academy of Fine Arts in Philadelphia. It is a very traditional school and I loved it. If I could, I would still be taking classes there. Well, one of the traditional things they do is have you sketch plaster casts of classical statues. I was doing a drawing looking down on a terra-cotta bust of some old guy, a pope or a bishop, on this darker beige paper that was thick and cheap and was wonderful to draw on. That is when I first discovered that you could lightly layer colored pencils in a wonderful way. Up until then I never really used colored pencils. I was just a regular pencil and ink type of artist. an old colored pencil drawing done back in the late 1980s at the Pennsylvania Academy of Fine Arts in Philadelphia. You can see the drawing has been through fire and flood over the years, but it’s one of my favorite drawings. The thing I loved about this was the tones you got when layering oranges and purples on top of each other. It was a revelation to me. Well, Cecile, I think you are right and these drawings will be more effective and fun to draw on the darker Stonehenge. Thanks : ) see, if I had ordered the Fawn, it would be a completely different project. Procrastination pays! For the last few years I have been sketching people on the el everyday, going to work and coming home... on the Brown Line. 6 sketchbooks have been filled. For this project I took snapshots of many of the sketches (about 900 or so) and put them in a database (Airtable) I have culled them down to about 160 of the more interesting people. Below is a screenshot of some of the groupings I was starting with. I will start a facebook album of pictures from the planning stage of this very long-term project so you can see what I am thinking about. and we’ll see what happens! this is how my tiny little rough sketches look like when you blow them up and put them in photoshop. The mat is something I cut out and taped to the top of my computer. That way I can figure out the size and placement when I block it in for the first time. For my first post I wanted to show you the kinds of maps (doodles) I draw for myself to keep track of my Architectural Detail Series. Originally I thought I would have 12 elements for this project. One image for each of the, now 8, cta stops in the loop and one for each corners. The first corner is already done (no. 2 the Pillars of the Second Leiter building) and I have images chosen (mostly) for the other 3. The Randolph Tower for the north-west corner, the medallions of the old Insurance Exchange building for the south-west corner and a detail from 180 N. Wabash for the north-east corner (or perhaps the Virgin Hotel) The idea with having 12 images was the certainty in my mind that a calendar would be the end result of all this. Now I’m not so sure and I have another project simmering on the back burner, so I thought I would see what people think. For more information on my new project, see my facebook page, or wait for the next blog post.